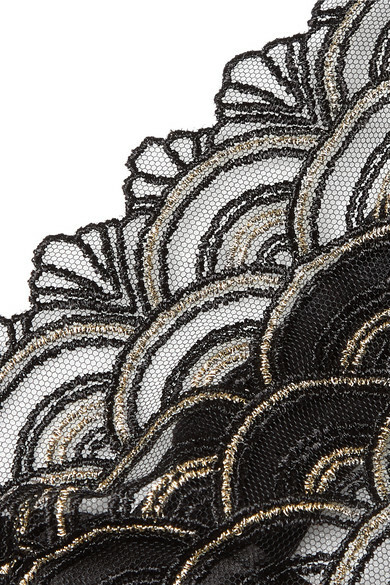 Coco de Mer's '20s-inspired collaboration with the V&A is so opulent and luxurious. This 'Gilded Arch' balconette bra has comfortable cups that give slight lift and a slender silk-satin underband. The sheer stretch-tulle is embroidered with gold scalloping that matches this thong perfectly. Wear it with: STONE AND STRAND Ring, Loren Stewart Ring, Natasha Schweitzer Necklace, Wwake Ring, Loren Stewart Earrings, Loren Stewart Bracelet, Monica Vinader Chain.